Universal Joint. Connect shafts at different angles or with different alignments. Combine any available bore sizes. Material: Polycarbonate Hub, Brass Inserts. 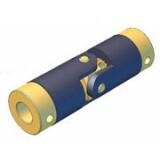 Bore Size "B" Bore Size "B"
Universal Joint, Double, Bore Sizes: Bore 1 = 3mm, Bore 2 = 3mm. ..
Universal Joint, Double, Bore Sizes: Bore 1 = 3mm, Bore 2 = 4mm. ..
Universal Joint, Double, Bore Sizes: Bore 1 = 3mm, Bore 2 = 5mm. ..
Universal Joint, Double, Bore Sizes: Bore 1 = 3mm, Bore 2 = 6mm. ..
Universal Joint, Double, Bore Sizes: Bore 1 = 4mm, Bore 2 = 4mm. ..
Universal Joint, Double, Bore Sizes: Bore 1 = 4mm, Bore 2 = 5mm. ..
Universal Joint, Double, Bore Sizes: Bore 1 = 4mm, Bore 2 = 6mm. ..
Universal Joint, Double, Bore Sizes: Bore 1 = 5mm, Bore 2 = 5mm. ..
Universal Joint, Double, Bore Sizes: Bore 1 = 5mm, Bore 2 = 6mm. ..
Universal Joint, Double, Bore Sizes: Bore 1 = 6mm, Bore 2 = 6mm. ..
Universal Joint, Single, Bore Sizes: Bore 1 = 3mm, Bore 2 = 3mm. ..
Universal Joint, Single, Bore Sizes: Bore 1 = 3mm, Bore 2 = 4mm. 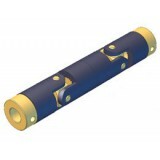 ..
Universal Joint, Single, Bore Sizes: Bore 1 = 3mm, Bore 2 = 5mm. ..
Universal Joint, Single, Bore Sizes: Bore 1 = 3mm, Bore 2 = 6mm. ..
Universal Joint, Single, Bore Sizes: Bore 1 = 4mm, Bore 2 = 4mm. ..
Universal Joint, Single, Bore Sizes: Bore 1 = 4mm, Bore 2 = 5mm. ..
Universal Joint, Single, Bore Sizes: Bore 1 = 4mm, Bore 2 = 6mm. ..
Universal Joint, Single, Bore Sizes: Bore 1 = 5mm, Bore 2 = 5mm. ..
Universal Joint, Single, Bore Sizes: Bore 1 = 5mm, Bore 2 = 6mm. ..
Universal Joint, Single, Bore Sizes: Bore 1 = 6mm, Bore 2 = 6mm. ..